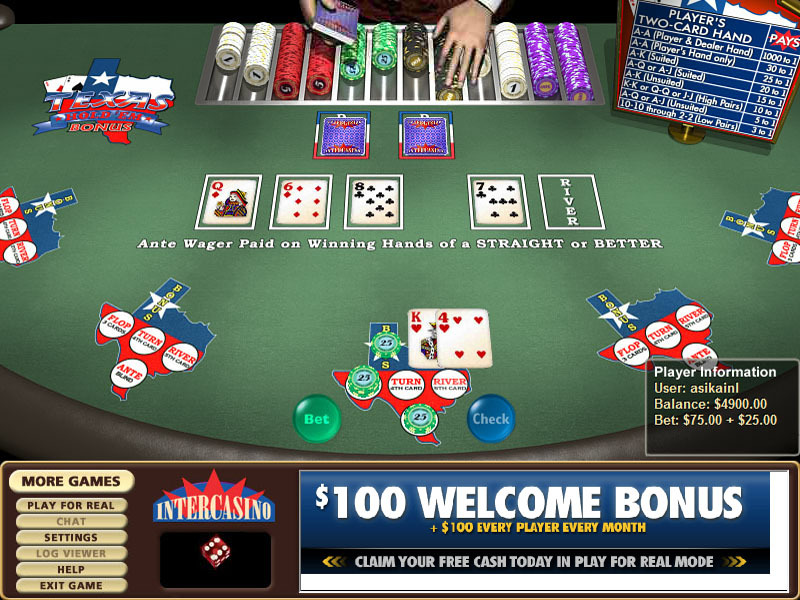 Texas Hold’em bonus is a Texas Hold’em poker variation where you play against a dealer and not against other players as usual. The main casino softwares offering this game are Cryptologic, NetEnt, Party Gaming and Wagerworks. When making the Ante bet, notice that your final bet size will be 3x – 5x the Ante bet depending on the raises you make. So pay attention to not make too large Ante bets. There are three strategy decisions to be made during playing the hand. The first decision is to whether raise or fold after getting the hole cards. And then there are two decisions on whether to raise or call after the flop and turn. These decisions depend on your hand versus the community cards, while dealer’s hand is unknown so the optimal strategy is complicated. The first strategy decision is to either play or fold the hand before community cards are dealt. The optimal strategy (minimizing house edge) is to fold unsuited 2/3, 2/4, 2/5, 2/6, 2/7 and play all other hands. So the player should still play for example unsuited 3/6. The player should raise his bet if the probability of winning the hand is bigger than the probability of losing the hand. The correct strategy is to raise rather often which also increases the overall variance of the game. Under standard rules the house edge of Texas Holdem bonus with bonus wagering is 0.53% by playing optimal strategy. The variance of Texas Holdem bonus is quite high because of frequent raises. The average bet size is 3.82x the Ante which the player should take into account when deciding the size of the Ante bet. The standard deviation per wagering unit of one hand in Texas Hold’em bonus is 1.79.